Embryology is the branch of developmental biology that studies embryos and their development. The field of developmental biology encompasses the overall study of the process by which organisms grow and develop, including cell growth, cellular differentiation, and, "morphogenesis," which is the process that gives rise to tissues, organs, and anatomy. Embryology, a subfield of developmental biology, is the study of organisms between the one-cell stage (generally, the zygote) and the end of the embryonic stage, which is not necessarily the beginning of free living. Embryology was originally a more descriptive science until the twentieth century. Embryology and developmental biology today deal with the various steps necessary for the correct and complete formation of the body of a living organism. The wonder by which a single, fertilized egg differentiates into diverse cells, tissues, organs, and systems of a fully formed organism—the heart, lungs, brain, arms, endocrine system, muscles, and bones of a human, for instance—remains a mystery that embryologists attempt to unravel. Embryology is the classic study of morphological changes within the embryo. 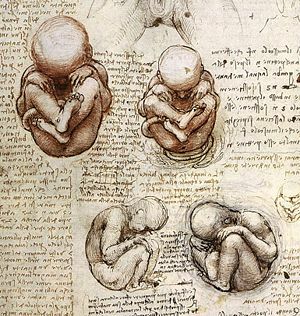 Aristotle is said to be the first person to undertake a study in embryology. Aristotle observed the ontogeny of chicken embryos by breaking open eggs at various time intervals during incubation. In the 1950s, with the discovery of the structure of DNA by Watson and Crick, and the rapidly increasing knowledge in molecular biology, developmental biology emerged as a field of study interested in the role that genes play in development. In other words, developmental biologists wanted to know which genes are responsible for each morphological change that occurs in development. Perhaps even more importantly, developmental biologists sought to explain how the various cell types of a multicellular organism arise from a single fertilized cell, the egg. Development of an embryo can be divided into several stages. The first stage is fertilization, in which the sperm penetrates the egg. The nuclei of the sperm and egg then fuse to form a diploid zygote (with paired chromosomes). Cleavage follows, in which the single cell composing the embryo undergoes mitosis (cell division), resulting in many cells called blastomeres. Each blastomere has the exact same genome (set of DNA) as the zygote. These blastomeres come to compose a solid ball of cells called a morula. The final event of cleavage involves the formation of a blastula, or a hollow ball of blastomeres containing a blastocoel, or fluid-filled cavity. Gastrulation is the stage in which the blastomeres partition themselves into three distinct germ layers: the ectoderm, mesoderm, and endoderm. The ectoderm is the outermost layer and will eventually develop to form the skin and nervous system. The endoderm is the innermost layer and will eventually develop to form the lining of the gut and internal organs. The mesoderm is the middle layer, which eventually forms the muscles, bones, and heart. After the forming of the gastrula (the multi-layered structure formed during gastrulation), the cells begin to differentiate, or undergo physical and chemical changes that will determine their individual identities (as muscle cells, kidney cells, etc.). Growth is the last stage, in which cells divide and proliferate, eventually composing all the major organs of the body. One of the significant questions that early developmental biologists sought to answer was how cell individuation occurs. Almost every cell in the body contains the exact same DNA as every other cell, as they all are derived from the initial zygotic cell. So how is it that some cells become cardiac cells and others become skin cells? One explanation offered for this question is termed induction, the process whereby the development of a cell, or the fate of a group of cells, is influenced by neighboring cells. The early development of an egg is influenced by the mother. When an egg is first fertilized, its cytoplasm contains lots of the mother’s RNA and proteins. In fact, the fertilized egg does not actually start to transcribe its own DNA until the blastula contains about 4,000 cells. The mother’s RNA and proteins are not dispersed homogenously throughout the egg’s cytoplasm. Instead, they form gradients, so that each section of the egg has a particular selection and quantity of the mother’s RNA and proteins. This is called the maternal effect. When cleavage events occur, different groups of cells in the blastula are exposed to different environments from one another. The different environments consist of different selections and quantities of the mother’s RNA and proteins. The mother’s RNA and proteins act as signals for the cells, telling the cells which genes to turn on or off. Thus, because different cells will receive different signals, they will develop differently via cell-intrinsic signals and will produce individual signals of their own. Induction is held to occur when a cell produces a certain signal, for example, by emitting a protein. The protein may diffuse around the cell source. Cells that are closely neighboring the source will receive lots of the signal, while more distant cells will receive less or none of the signal. Therefore, cells will develop different characteristics and functions depending on their relative location to other cells, and thus their individual cell-cell interactions. Although the phenomena of induction provides insights into how cells individually differentiate into diverse structures, a comprehensive understanding of this process, from an individual egg cell to particular organs, lacks consensus. Notably, some developmental biologists question an underlying assumption of embryonic development that genes ultimately direct the changes, maintaining that the genetic matter only determines which proteins can be produced, but not the form of the organisms (Wells 1997). Scientists often use model organisms (a species that is extensively studied to understand particular biological phenomena) to learn about how development occurs in animals generally. Although all species develop somewhat differently, there are also many similarities that occur in development in species. For example, certain groups of genes are conserved between humans and flies and worms. Some common examples of model organisms are the fruit fly Drosophila melanogaster, Caenorhabditis elegans (nematode worm), E. coli, the mouse, the zebrafish, and many others. Ontogeny (also ontogenesis or morphogenesis) is a term that describes the origin and the development of an organism from the fertilized egg to its mature form. Ontogeny is studied in developmental biology. In 1866, German zoologist Ernst Haeckel theorized that "ontogeny recapitulates phylogeny" (the evolutionary history of a species), and this theory (which was also independently established by others) became known as the biogenetic law or the theory of recapitulation. The idea that ontogeny recapitulates phylogeny, that is, that the development of an organism exactly mirrors the evolutionary development of the species, repeating the adult forms of the organisms, is discredited today. Likewise discredited is the ancillary principle that the there is "terminal addition"—evolution proceeding by adding stages to the end of the ancestral organisms (Gould 1977). However the phenomenon by which a developing organism will for a time show a similar trait or attribute to that of an ancestral species, only to have it disappear at a later stage, is well documented. That is, embryos seem to repeat the embryonic stages (not adult stages) of their ancestors. For example, embryos of the baleen whale exhibit teeth at certain embryonic stages, only to later disappear. A more commonly given example is the emergence of pharyngeal gill pouches of lower vertebrates in almost all mammalian embryos at early stages of development (April, 2001). Note, however, in terms of this later example, some embryologists state the resemblance of pharyngeal pouches in mammals to the gill clefts of fish is illusory, and there is no embryological reason to make such a claim (Wells 2000). Dawid, I. B. 2004. Organizing the vertebrate embryo—A balance of induction and competence. PLOS 2 (5). Gould, S. J. 1977. Ontogeny and Phylogeny. Cambridge, MA: The Belknap Press of Harvard University Press. Gould, S. J. 2002. The Structure of Evolutionary Theory. Cambridge, MA: The Belknap Press of Harvard University Press. Wells, J. 1997. Homology in biology. Origins and Design 18:2. Wells, J. 2000. Icons of Evolution. Washington, DC: Regnery Publishing. This page was last modified on 3 April 2008, at 20:07.